Anke Van dermeersch was Miss Belgium 1991 and represented Belgium at Miss Universe 1992 pageant in Bangkok, Thailand where she placed in the top six. Today, the 6'1" blond stunner is married, a trained lawyer, and a senator of the anti-immigration party Vlaams Belang (Flemish Interest) which is also vehemently anti-Islam. It is rare for a beauty queen, even if she has pursued a political career, to speak out against Islam that seeks to destroy Western society from within and replace it with Sharia law, but Anke is an exception. She knows that Belgian culture is under Islamic threat, especially now that her country has become the largest producer of Islamic jihadists in the world. WHILE COMPETING IN MISS UNIVERSE 1992, ANKE'S AVERAGE SCORE OF 8.983 WAS ENOUGH TO SAVE HER A TOP 10 SPOT. Anke is not new to controversy. On September 19, 2013, she started a campaign called "Freedom or Islam?" ("Vrijheid of islam?") in which she lent her legs for an image suggesting the consequences and reactions that women could face regarding the length of their skirts, alluding to the growing Islamic threat to Belgian culture. Consequently, French shoe designer Christian Louboutin sought an injunction against the party's campaign, which he claimed had associated his iconic brand (the red soles) with a poster entitled "Women Against Islamization." Anke had words etched along her naked leg marking potential skirt lengths - ranging from "Sharia compatible" at the ankle, to "stoning" high up her thigh. Louboutin argued that the poster tarnished the image of his luxury footwear brand. A month later, the Belgian court ordered Anke to stop using Louboutin's shoe wear in her campaign materials. Immediately after the verdict, Anke slightly modified the posters showing seemingly identical shoes but with yellow soles. When asked whether it is the same brand, she replied: "I got rid of the Louboutin shoes. These ones are my Flemish nationalist shoes." In the video below, Anke said that she was perplexed as to why Louboutin was attacking her, especially since she was standing up for women's rights which the designer should be appreciating. She also claimed that the inspiration for her campaign was singer Nancy Sinatra's biggest hit song, "These Boots Were Made For Walking." One could very well consider Anke as the modern-day Belgian Cassandra; in Greek mythology, Cassandra foresaw the destruction of Troy. Referring to her book "Hoer Noch Slavin" ("Neither Whore Nor Slave"), Anke stated: "We want women awaken and warn against the Islamization of Europe, because if it continues, women will be the first victims. The emancipation which our mothers and grandmothers fought, cannot simply be reduced by a misogynistic Islam." 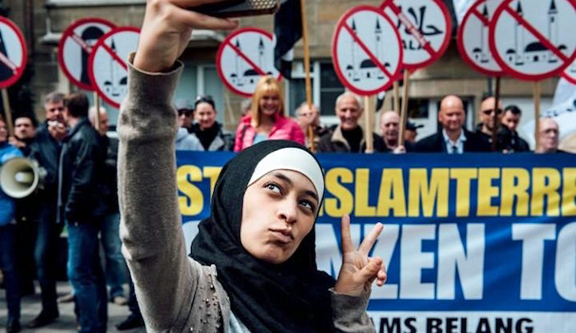 On May 14, 2016, Anke and her party made the news again during an anti-Islam rally in Belgium when a young Muslim woman named Zakia Belkhiri, 22, took selfies next to Vlaams Belang protesters while gesturing a peace sign as her way to fight Islamophobia. A Belgian soldier named Tim Geelen and a leading Dutch website later revealed that Belkhiri had posted anti-Jew comments four years earlier on her social media (Twitter, Facebook). Anke Van dermeersch is a lawyer, a deputy in the Flemish Parliament (Vlaams Belang), a Federal Senator (Belgium) and a local council member in Antwerp. 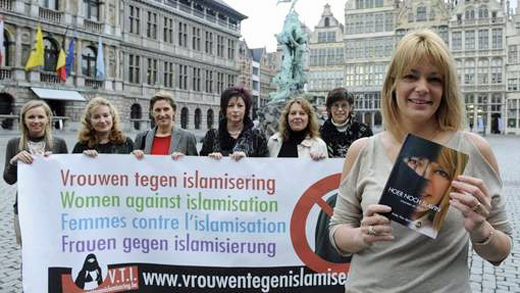 She is also the founder and the president of the European Association “Women Against Islamization”. She was Miss Belgium in 1991. After decades of multiculturalism and related educational policies paid for with public money, what do you think is the real degree to which Muslim immigrants have been integrated into European society? Should we be speaking about "acculturation" or "Islamization"? Multiculturalism is bad for our own European culture because we allow and even pamper foreign cultures on European territory. Our culture is the breeding ground of our pluralistic society and, therefore, it shouldn’t be replaced with blind multiculturalism that undermines pluralism. Tolerance has its limits. To a certain extent, Western society is a result of mass immigration and a multi-cultural and multi-ethnic society. But such a “multicultural” society does not work, has never worked and never will work. In practice, multiculturalism is equivalent to blindly accepting and embracing Islam, which automatically leads to the Islamization of Europe. Islamization is not a mere local problem. This is a phenomenon that is taking place in almost all Western European countries and cities. Within a few decades, many Western European cities are likely to be confronted with Islamic majorities due to the fast demographic increase in the Muslim population living in the West. You are the President of the European Association “Association of Women against Islamization”. Do you think women are the first victims of this Islamization? The first and foremost victims of Islamization are indeed women. Not only in the Muslim world, but also in the Islamic communities of Europe, females are systematically discriminated against, oppressed and molested. According to Islam, women are subordinate to men and they owe their fathers and husbands their unquestioning obedience. In the Islamic tradition, the men invariably take all important decisions over their wives and daughters. For example, Islam dictates that a man can chasten his wife if necessary in order to keep her in line. With respect to the treatment of women, Islam is synonymous with humiliation and discrimination. Muslim women can only inherit half as much as a man can and according to Islamic jurisprudence, the testimony of a woman is only half as trustworthy as that of a man’s. Furthermore, Islam forces females into wearing head scarves, veils and even burqas since women are deemed responsible for men’s sexual restraint. Islam also considerably curbs women’s liberty of action. Without the permission of her husband, a Muslim woman cannot even leave the house. Savage practices such as honor killings, forced marriage, polygamy and circumcision are making inroads into our society through Islam. The Belgian judiciary, which is so lenient towards others, has condemned your Association for some of your propaganda posters. What is behind these convictions? I made a “leg-poster” campaign for WomenAgainstIslamization.org where I measured the degree of Islamization with the length of my skirt covering my legs. This poster is famous for many different reasons, but notably because it is still being shared across the world on the internet to this day. A famous French shoemaker sued the organization and myself because he didn’t want me wearing his shoes on the poster because I’m a right-wing, conservative politician. After a dubious, media-spun court process, I was sentenced to never wear the shoes again and to stop spreading the poster. As soon as any campaign by WomenAgainstIslamization.org is successful, we are harshly attacked and/or subpoenaed. Belgium is a European country in which a proportionally greater number of “young women" have joined ISIS. Is this the greatest failure of Belgian assimilation policy? The Belgian state security services estimate the number of Muslim extremists in our country to be at 2% of the population while worldwide it is in fact 8 to 10% of the Muslim population that turns to Salafism and considers violence a legitimate means to spread Islam. Belgium also produces the largest number of jihadists in the world. Almost 500 fighters went to Syria to fight, including women. Between 10 and 30% of those jihadists have left the war zone and most of them have returned and now pose a major threat to Western countries. Your book on the situation of women in Islam is entitled “Neither Whore nor Slave". Does the Koran really condemn women to a position of submission and sexual exploitation? People are usually silent about the position of women when debating Islam. In most debates, Muslims’ violation of Western equality between men and women is mentioned, but it is rarely debated in detail. But the position of women in Islam is indeed questionable. The Korean elevates the man as superior and according to the Koran men have authority over women because Allah has taught the one to be superior to the other. Men and women have different roles in the Koran and therefore, women do not enjoy the same rights as men. In the Muslim world, men are seen as superior to women, which obviously has negative effects on family life, where the oldest man of the family is the boss. Disobedience or disagreement on the part of the woman leads to “discussions” and sometimes even to violence. Men traditionally have their way with women and this happens without any consultation with their wives. Muslim women are indeed condemned to submission. How is it possible that feminists do not denounce Islamists? While they are more than ready and able to attack “European patriarchy”, they don’t even say one word about Islamist discrimination against women. Is this because of fear or is it an effect of “political correctness”? Since multiculturalism in practice is equivalent to blindly accepting and embracing Islam, it is necessarily bad for women and contradicts the objectives and ideals of feminism. Feminism thrives only thanks to Western values such as equality between men and women, autonomy, freedom, and individuality. Non-Western cultures, such as Islamic culture, do not know these values and thus naturally collide with feminism. The feminist movement has a turbulent history. However, what is currently taking place is an existential conflict. On the one hand, the emancipation of women with different ethnic and religious backgrounds is encouraged. On the other hand, the so-called ‘freedom of choice' to wear head scarves is defended. As I understand it, political correctness has led to absolute schizophrenia. Are European and Islamic concepts of family and marriage and an Islamic Europe comparable? In our country, Islam often comes into conflict with our legal provisions on family law. This is because the Koran imposes its own rules related to marriage and divorce, child custody, and rights of inheritance. In the context of migration, it is important to act strictly against marriages of convenience and arranged or forced ones. Legislation on family reunification should be strict and efficient in the field of immigration policy. In addition, society must have the courage to deny access to our territory to partners with a criminal record. Clearly, what’s needed is a tough approach in various legal and policing areas. Reluctance to integrate is facilitated by allowing the partner of a forced or arranged marriage in the home country to come and “reunite” with the other partner. This is undermining our society. Some Muslims and multicultural propaganda say that Muslim women wear the burqa or niqab thanks to "free choice." Do you think this is true? There are young girls who wear the headscarf and claim that they have taken this choice in full freedom. Of course, everything depends on the interpretation of “freedom” and “choice.” Wearing a headscarf is warm, annoying, and uncomfortable; therefore most Muslim women are constantly fiddling with it. At the same time, they must also constantly make sure that their hair does not come peeping out. After all, the purpose of the headscarf is to completely cover the hair. No woman on earth freely keeps such an uncomfortable scarf at hand at all times. Instead, the point is that there are consequences for not wearing it. In Schaerbeek in our country, a 32-year-old Muslim woman of Pakistani origin experienced just how bad these consequences are when she was killed by her three brothers because she refused to wear a head scarf. Sexual attacks occurred in Cologne and other European cities on last New Year's Eve. Can they be explained by Muslim hatred for European women? We know that mass immigration to Europe has also brought the grooming practices of Islamic gangs (especially among Pakistanis and Somalis). Non-Muslim, underage girls are sexually abused and prostituted by these groups when under the influence of alcohol and drugs. Muslim group-rapes of non-Muslims have everything to do with the hate for women that is part of the culture of Islam. What happened in Cologne is an example of the Arab ‘taharrush’, or sexual jihad, which is described in the Koran. Do you believe that sexual assault could become an epidemic throughout Europe if the government does not act quickly? Women are discriminated in many ways and considered inferior in Islam. This is expressed, for example, in the inhumane and unjust treatment of women seen in such rapes. The completely twisted sexual morality of Islam says that men carry no responsibility for their sexual behavior. It is a fact that men go unpunished for such acts in the Islamic community. Letting this happen is based on the mistaken assumption that the values and standards of the surrounding society will be automatically absorbed by immigrants over time. This also ignores the fact that these cultural and religious groups within Western society have their own ideological agendas and empower themselves based on reactionary forms of identity. I fear, as the figures already confirm, that there will be more and more such serious crimes against women in Europe. In your opinion, what can be done to stop the Islamization of Europe? Enough is enough. We must put a stop to the immigration of such foreigners and put a definitive stop to Muslim immigration!